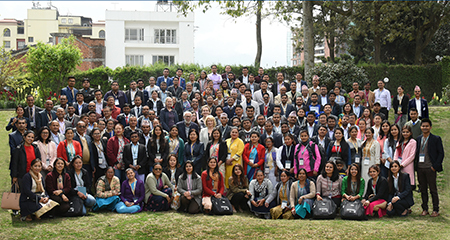 Each year, NSI in collaboration with the Department of Health Services (DoHS) and National Health Training Center (NHTC) jointly organize a conference for healthcare workers from all over the country. A health worker must submit a case story from their experience in their rural institution as a ticket in order to participate in the conference. Workers then share their stories in small groups with the best stories presented in plenary sessions in front of government workers. Government workers have identified a number of clinical areas of importance to their work. NSI works with consultants to develop short CME sessions tailor-made to these expressed needs. These include primary eye care, trauma assessment, orthopedic casting, and delivery refresher. The Annual Conference provides a forum for the Ministry of Health to meet representative employees from across the country. Workers express their problems and government responds and gives information about emerging programs.